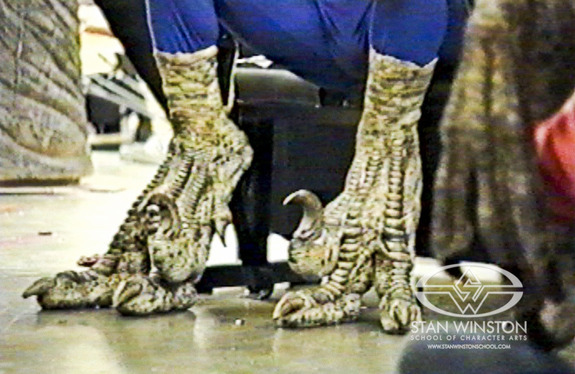 I've been thinking of making a raptor costume like the ones from Jurassic Park, and I've seen the feet extensions they wore, but does anyone have advice on how to make them? I'm going to be talking to my welding teacher tonight for any advice on welding up some parts, but I don't know if they should be weighted at the bottom, or if there's specific angles that the portion your foot attaches to should be at. I'll upload some design sketches later when I have access to my scanner. If you've made any before please let me know! What John wore were simply high heel style foot extensions. You can always use a pair of football cleats and bolt them to a metal frame, but you would want to put a calf brace that way you don't role your ankle, and you would also want to add rubber grips to the bottom of your extensions to minimize slippage. This is known as a digitigrade foot, where the creature walks on its toes with an elevated heel. So what you need are a set of digitigrade stilts. The cosplay community uses this type of stilt very frequently, most often for canine creatures, so there are a ton of instructables and YouTube tutorials on making your own. There are even a few very cheap kits to make your own. As with any type of stilt, be very careful. Learning to walk in them takes time, and falling or twisting an ankle is never fun. you know what I'd do to get the claw retracting? I'd put an arduino in each digitigrade stilt which would drive a servo motor at the big toe when it received an analog imput from a force-sensitive resistor.